June returns to the town of her birth by surprise after spending time abroad. The return home will be painful: her family and her first love, Diego, have changed. She too has changed, and repairing the broken ties won’t be easy. But just like the autumn wind, June will take the place by storm. Lara Izagirre graduated in Audiovisual Communication from the University of the Basque Country. She continued her film studies at the New York Film Academy and worked for two years at the Forensic Films production company in the same city. 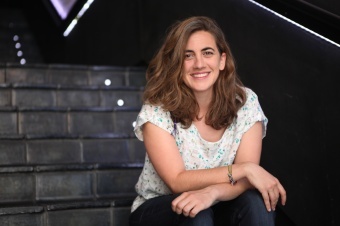 She also has an MA in Screenwriting from the Escuela Superior de Cine y Audiovisuales de Cataluña. In 2010 she founded the production company Gariza Produkzioak, from where she wrote, directed and produced the short films Bicycle Poem (2010), KEA (2011) and Larroxa (2013), the medium-length documentary Next Stop: Greenland, and the short documentary Sormenaren Bide Ezkutuak (2013).